I've been having a brilliant time with my new toy - a Gelli Plate. I suddenly realised I needed one when they were advertised at half price in my local craft store ;) Fortunately I already owned a brayer, which hadn't seen the light of day for years, and several bottles of acrylic paints which had also been languishing in the bottom of a box, so it was the least I could do for them. And that's all you need to get going. Except the card to print on, and any bits and pieces that can create a pattern (buttons, string, bubble wrap, corrugated board, etc, etc). There are some very good video tutorials online that show you how easy it is to create your own patterned paper. 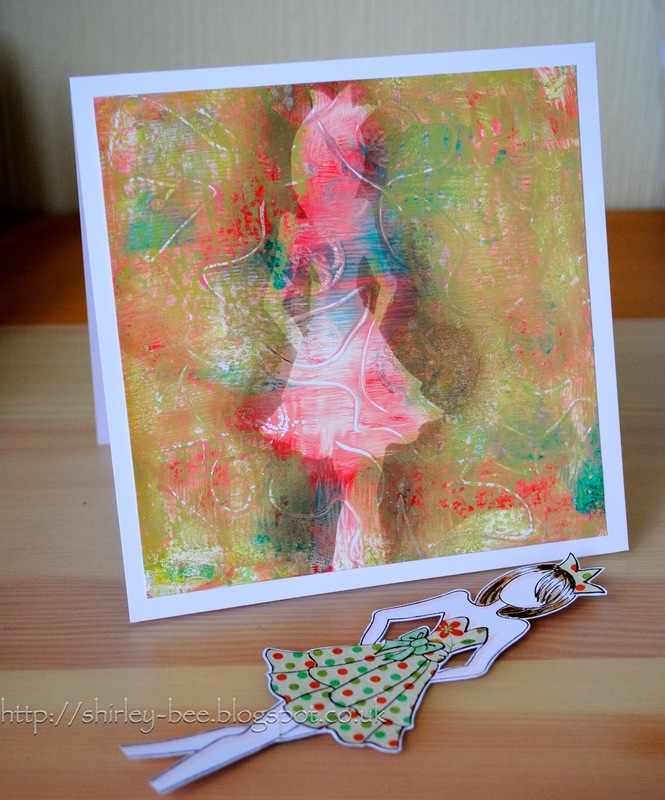 And I'm also entering it into Moxie Fab World Handmade Cards Week Colour Media Challenge. I stamped the doll onto white card, coloured and paper pieced it, then trimmed it to leave a narrow white border. 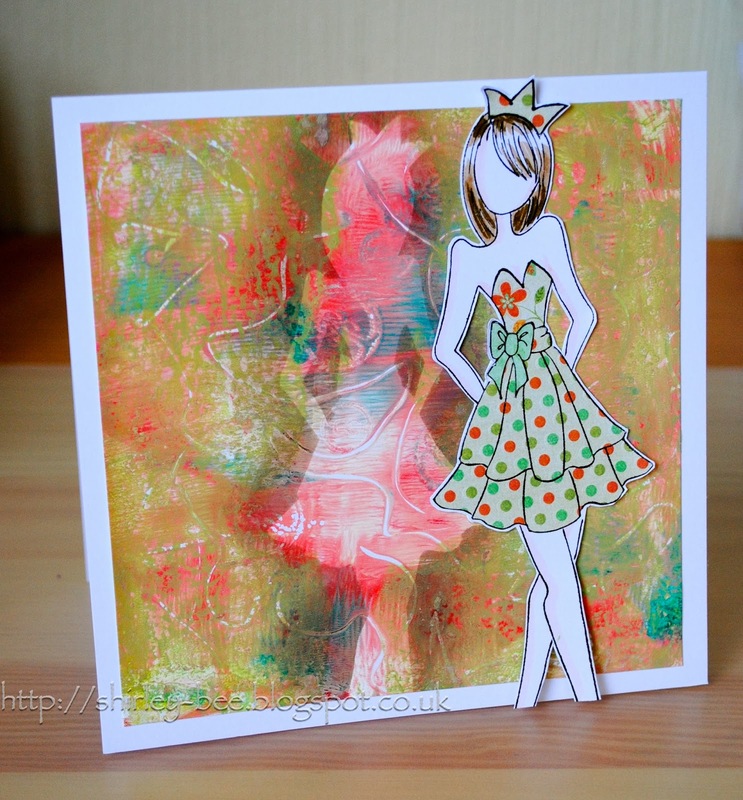 I also stamped off onto scrap paper and cut that out along the lines to use as a mask on the Gelli Plate. To be honest, I liked the card just as much without the stamped doll, but for the purposes of the CASE Study challenge, I wanted a doll and a shadow to represent the two dolls in the inspiration picture. Wow, what an awesome effect! this card rocks, love it!! :) the doll echo in the background. Amazing effect :) I love the way you place the stamped image over the card. Cool effect!! Wow! The end result is definitely worth all the time, effort and awesome fussy cutting! Seriously, this would make a beautiful full size picture! Perhaps you should 'branch out' into modern art pieces and become just as famous in the art world as you are in our blogland! Your creativity is endless Shirley! Wow! I love this! I bought a Gelli plate early this summer and I have yet to use it!! You have inspired me to try it!! omg wow! this is beautiful! i love all the details you put into this!!! thanks for sharing! I am sooo jealous! I've been wanting a gelli plate for ages, but can't find it in oz and thought postage would be too much from o/s. nNow for your card - Absolutely fantastic! You win the prize in my book! SUPER amazing! Love the mirror like quality and it honestly brings to mind Degas to me....WOW! Wow is that cool. I love the card before the paper doll too! Looks like a fun toy. I have paint, a brayer and plenty of stuff to make patterns. Better check this toy out further. 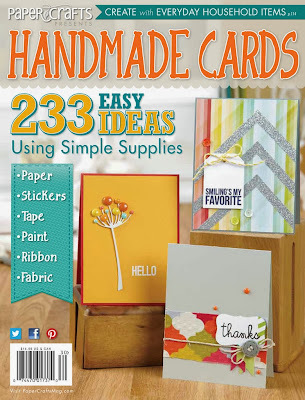 BTW, I think you need to be on the Craft Stamper DT. Just sayin'. I really love this one! !